My New Air Pollution Monitor: Gimmick or Game Changer? A few months ago, our family invested in our own air quality monitor. This little sensor has made invisible air pollution visible. And it’s changing the way we think about the air we breathe. Turns out, we’re not the only ones geeking out on home pollution monitoring. Here in California, private citizens have deployed more than three times as many air pollution sensors as the government agencies charged with the task of monitoring our air quality. The graph below tracks the adoption of PurpleAir monitors like ours in Northern California. PurpleAir Monitor adoption in Northern California: 2017-2018. The graph shows how the devastating Camp Fire in Northern California was good for PurpleAir business. Thanks to Duncan Callaway for scraping these data. Once connected to Wi-Fi, privately owned PurpleAir devices feed into a global network and data are displayed in real time on a cool map. This enables a kind of public crowdsourcing of air quality information– an important shift away from the status quo. State and Federal government agencies have traditionally been the primary/only source of air quality data. Public provision makes sense because we all benefit when people can access reliable air quality information. And if the benefits are shared by everyone, it follows that the costs should be shared as well. But the high costs of monitoring have limited the scale of the public monitoring network. A single EPA air pollution monitor can cost as much as $100,000 to install and requires skilled staff to operate. On account of these high costs, there are fewer than 1000 regulatory grade air quality monitors measuring PM2.5 –the ultrafine particles that pose the greatest health risk –in the entire United States. Sparse monitoring would not be a big issue if pollution concentrations didn’t vary much over space. But exposure to pernicious local pollutants like PM2.5 can vary significantly over short distances. If you live far from an EPA monitor, the crud in the air you’re breathing can be very different from the measurements used to monitor and enforce air quality regulations. The upshot is that spatial gaps in the regulatory monitoring network leave wide gaps in our understanding/monitoring of air quality. Cue the low-cost, “consumer-grade” sensor revolution. Companies like PurpleAir, Atmotube, and Plume Labsare putting air pollution monitors in the hands of private individuals and community organizations. And these little sensors are starting to fill some big gaps. The map on the right plots the government-operated, regulatory-grade monitors where I live (the Bay Area). The map on the left is a recent snapshot of monitor readings from Wi-Fi connected PurpleAir monitors in the same area. Wow. You might be concerned that you get what you pay for with these low-cost sensors. It’s true that PurpleAir sensors (and other consumer-grade sensors) use a different technology to count the tiny particulates in our air. Although this technology is not as reliable as regulatory grade monitors, our colleagues at the Lawrence Berkeley Lab have put these low-cost monitors to the test and found that PurpleAir sensors performed surprisingly well. 1. Particulate pollution is hyper-local: Living 3 miles from the closest government monitor, we were curious to get a better read on the quality of the air our family breathes every day. We live far from a major road, so we are fortunate to breathe air that seems generally cleaner than the closest EPA monitor records for regulatory purposes. Others are not so lucky. Nearby (indoor) PurpleAir (PA) monitors located downwind of a major highway seem to read consistently higher. 2. We live indoors: Most of us spend most of our time indoors. It is, therefore, remarkable that the health effects of indoor air pollution are relatively poorly understood. Almost everything we know about the health effects of pollution exposure is based on outdoor pollution monitor measurements. Until we installed our PA monitor, I didn’t think much about indoor air quality. My assumption was that if pollution particles are impossibly tiny, they must pass easily between indoors and outdoors. And so PM2.5 levels should be more or less the same indoors and out. Turns out that assumption is not quite right. The graph below plots hourly PM2.5 concentrations inside our house (blue) and at the closest outdoor PA monitor installed less than a mile away (orange). These data were downloaded from this PurpleAir website where you can access high-frequency monitor data from thousands of monitors around the globe. Thanks to PurpleAir for making these data so accessible! In the first couple of months after installing our sensor in September, particulate concentrations inside our house tracked outdoor air quality fairly well. But you can see instances when our air quality is worse than outdoors. Reasons include: stovetop popcorn, forgetting to run the stove vent while cooking dinner, and our third grader’s science experiment run awry. But then came the Camp Fire in November. Northern California was mired in awful smoke for over a week. Outdoor particulate concentrations reached dangerous levels. Initially, our indoor air quality climbed in lock-step with outdoor air quality. But with the help of our PA monitor, we started experimenting. Real-time monitor feedback helped us figure out what was working (replacing our furnace filters and running the fan 24/7) and what was making things worse (running our kitchen stove vent which pulled outside air in). We managed to improve our indoor quality considerably while the outdoor air quality remained terrible. When the government is the sole provider of air quality information, the government gets to choose where and how air quality gets measured. Recent research by some of our colleagues highlights some concerning aspects of the where and how of past air quality monitoring activities. As for the current administration, the Trump EPA has been working hard to downplay concerns about air pollution and reduce the stringency of air pollution regulations. If you find all of this very concerning, a consumer-grade air pollution monitor gives you a way to increase the level of publicly available air quality information and scrutiny. Ever since we connected our monitor back in September, we’ve been transmitting high-resolution information on local air quality, displayed in real time via a user-friendly air quality map for all to see. The effect we are having may be incremental, but the aggregate impact of widespread adoption could be significant. The growing popularity of low-cost sensors is exciting. But a few thousand sensors operated by the likes of me does not a revolution make. If these little sensors are going to be transformative, they’ll need to be more widely deployed. And the data need to be actionable so that people can understand where the most dangerous pollution problems manifest and how we might address them. We’re already seeing some exciting grassroots and green shoots initiatives. In the year ahead, we should see a lot more. California’s AB 617 mandates that community-level air monitoring be put in place by mid-2019. To keep implementation costs manageable, low-cost sensors will likely play an important role. The specifics of that role still need to be worked out. Low-cost sensors are no perfect substitute for regulatory-grade monitors. But they could be important complements. If well-crafted policy implementation and community mobilization can catch up with sensor technology innovation, these cool gadgets could become a real game changer. Amendments to Rule 11-10 reduce monitoring of cooling towers for hydrocarbon leaks from daily to weekly, with provisions to extend monitoring periods after proving no leaks for an extended time. Costs for daily monitoring were found to be excessive relative to the potential hydrocarbon emission reductions. Requirements for cooling tower best management practices and reporting were eliminated when found to be focused primarily on Process Safety Management and cooling water chemistry rather than leak detection. The only feasible method to reduce ROG emissions from cooling towers is more frequent monitoring and repair, but this method was concluded to not be feasible due to economic factors as per CEQA Guidelines §15364. Thus, no feasible mitigation measures have been identified that could avoid the significant impact or reduce the impact to less than significant. Generally, CEQA (the California Environmental Quality Act) does not allow an environmental impact to be ignored based on the fact that reducing those impacts will cost money. And refineries certainly SHOULD be expected to spend money on such things as more frequent monitoring and repairs. Going to testify at these hearings – where testimony is limited to no more than three minutes, and often shorter – is both necessary and, seemingly, pointless. Does Solano County have to report to the public like this now – even under current regulations? Do they publish a notice like the one Nancy sent from Crockett? Is this something that our newbie “CUPA” needs to be doing on our behalf? I think the Working Group could be making a big deal out of this! I think I’ll post about it on the BenIndy. The Contra Costa Health Department considers a booth behind an elementary school two blocks away from a street fair in Crockett as a “public meeting..” They reckon that the booth where they will be twiddling their fingers while the locals drink and dance a few blocks away will meet its obligation to hold a face-to-face public meeting. Guess we are lucky. Martinez gets its face-to-face at a Christmas tree farm in August on National Night Out. 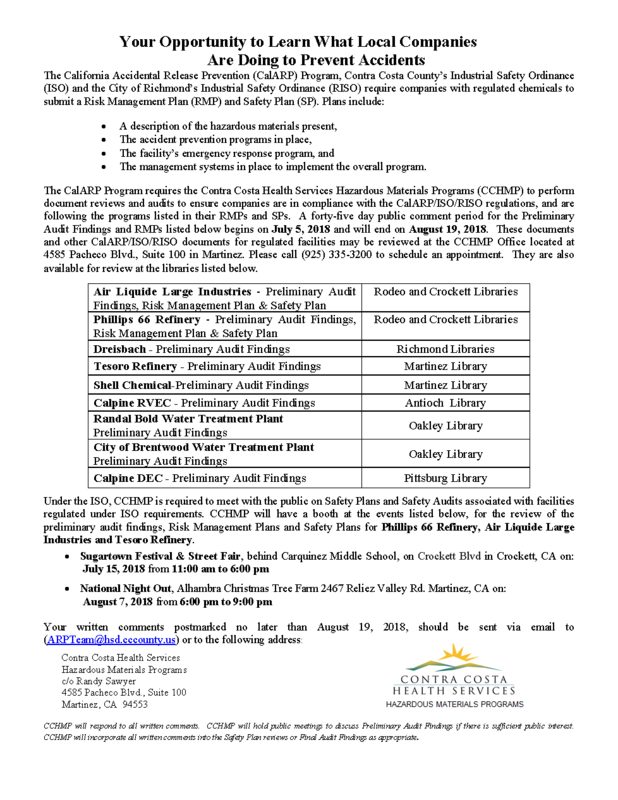 I noticed in the Benicia Herald this morning two public notices for Risk Management Plans prepared by Solano County Department of Resource Management, one for Praxair and the other for Benicia’s Water Treatment Plant. These are part of the 5-year audit review process, I believe, the same reports referenced in the Contra Costa County notice you sent around the other day. I figured there ought to be one for Valero, so I called the Solano County Department of Resource Management. Turns out the Valero plan was filed in Dec. 2017 and is still under review. The staffer I spoke with who is doing the review is suppose to call me about status. Interesting, I guess: no public meetings planned, copies of plans not available in our library (as in Contra Costa County). He seemed surprised at my question about public meetings, said he could check with management.